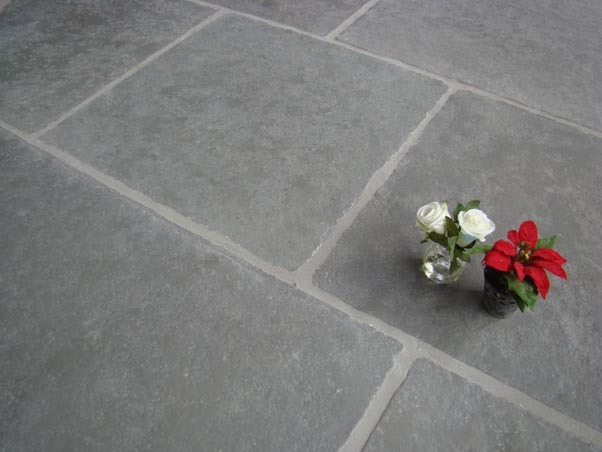 Our Classical Limestone range has been expanded further with the addition of the Grey Semi Honed Finish Limestone. High quality and durability of the stone is consistent throughout our range of Classical Limestone flooring. Each piece of limestone has hand cut edges, which are then tumbled to antique the stone. The top surface is then semi honed, which flattens any high spots on the natural finish, while leaving some texture for a more authentic and original feel. The stone is available in large format slabs which are calibrated to 20 mm thick. Each piece of limestone is 500mm wide and the length of the stone is 800mm long. We now also offer this stone in a large OPUS tiling pattern. The pattern consists of tiles which are 600x600mm (1), 600x300mm (2), 450x450mm (1) and 300x300mm (1).